At Global Windows, we are registered installers of the Guardian Warm Roof. The Guardian Warm Roof is a high performing solid roof system that creates a comfortable living area for you to enjoy all year round. Your home will never be too hot in summer or too cold in winter, instead you will have an energy efficient extended living space for all the family to enjoy. With a Guardian Warm Roof, you can easily upgrade your existing conservatory to greatly improve its performance. The roof system is designed so that you can replace your existing roof without affecting you’re original windows, doors, and frame. You can also choose a Guardian Warm Roof to be installed on a brand-new conservatory. 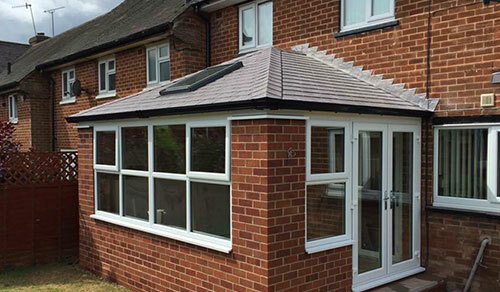 A tiled conservatory roof will transform a glazed extension, providing a more permanent solid feel to your home. Tiled roofs can achieve U-values as low as 0.8 W/m²K. This means that less heat will escape from your home and you will limit the amount of cold air which penetrates your home’s interior. Guardian Warm Roofs are so called because of their excellent insulating properties. With a Guardian Warm Roof, you’ll see a significant reduction in your heating bills for the entire lifetime of the roof. Guardian Warm Roofs have been through rigorous testing procedures. They easily achieve industry requirements for thermal, structural, and condensation prevention specifications. Tiled conservatory roofs from Guardian use Tapco Slate tiles. They are made from recyclable plastic and Dolomite limestone to create the random texture and scalloped edges of natural slate. They are strong, cost effective, recyclable, and aesthetically attractive. They have excellent weather resistant capacity and will not curl, lift, or deteriorate and are 100% water resistant. Tapco Slate tiles are available in a range of attractive colours. Choose from Stone Black, Pewter Grey, Plum, Brick Red, or Chestnut Brown to complement your home’s character. You also have the option of a Metrotile system. Each tile is pressed from high quality steel for superior strength. They are lightweight, low pitch, durable, environmentally friendly, low maintenance, and aesthetically pleasing. Conservatory roof tiles are available in several colours. Whether you want a traditional look or a more contemporary finish; there’s sure to be the perfect colour to match your home and your personal taste. Choose the best colour from our range to complement your home's character. Our conservatory roofs all achieve excellent levels of security. Their durable tiles are strong and robust, creating an almost impenetrable layer to your home.